From 169: Take 169 North from Tulsa, exit at 46th Street North, going east. Go approximately five miles to stoplight. Continue through light, going through Tulsa Port of Catoosa Main Gate. Go approximately one mile to Bird Creek Avenue and turn right. Agri-Nutrients is the third building on the left; large white building. From 44/412: Heading east from Tulsa on 44/412, take Exit 240A (Cherokee Casino) After exiting, turn left on 193rd Street. Go approximately five miles to stop light. Turn right into Tulsa Port of Catoosa Main Gate. Go approximately one mile to Bird Creek Avenue and turn right. 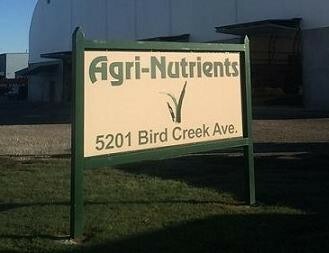 Agri-Nutrients is the third building on the left; large white building.